So, I was HOPING to post this EXTREMELY positive post today about how AMAZING Annabelle did yesterday off oxygen. But this gagging was a bit different. It was about an hour AFTER her feeds were done, which is unusual. And then she had it a few times in a row, about 15 minutes apart, and was vomiting up milk and moucus. (nasty, I know.) So Momma was really concerned. But she still seemed fairly happy. By 6 though, she was not so happy. It was time for her to eat, so instead of giving her milk, as normal, I made a Mommy decision and fed her pedialite instead of her milk. She’d been gagging so much, I just didn’t think her poor baby stomach would be able to handle it, and I did NOT want to get dehydrated again. Around 7, I put her back on a low amount of oxygen. Her color just didn’t look good, even though her SATs were staying steady around 90 – 91. Then the poop started. It started with just a massive blowout. But then a little while later, I noticed she was wet. But this wasn’t normal wet. This was soak through the back of the diaper onto the floor wet. I won’t go into description of this poop for you, but it was NOT normal. Called the doctor. They suggested pedialite for her 10PM feed, then try milk for her 2AM feed and see how she handles it. We’d reconvene if I got worried more or in the morning, whichever was earlier. We put her to bed, and she tossed and turned, which is NOT like Annabelle. A few minutes later, her blankets were covered with the same gross mucusy wetness. And thus proceeded the next MANY hours about every 10 to 20 minutes. She tossed and turned almost the WHOLE night. I finally fell asleep sometime in the wee hours of the morning, after her 2a.m. feed finished. I woke up this morning at 6:30 to a daughter swimming in, well, a watery smelly substance ALL over her crib. She is not a pleased camper this morning. I can tell her poor baby belly hurts. She’s having her 6 a.m. feeds late as I type, and I wanted to see how she handled them before I called the doctor back. My biggest concern, is that I think she is dehydrated. Her poor baby eyes are darker and sunken in a little. (Could also be because she got little sleep last night, she tossed and turned 90% of the time!) She is just missing her normal morning exuberance that is Annabelle. Usually she is bright and happy and wiggly and smiling. Today, she just wants to lay down and frown and plays half-heartedly with her toys. I’m praying this is a stomach bug, to be honest. We can handle that. I can even handle a reaction to her formula (although she got pedialite 2 feeds in a row and it didn’t help a lick, so I don’t think that is it.) I just… *sigh* I want my happy baby back! I really think she’s gonna be okay. I think between the yucky poop and the vomiting yesterday, she just got low on fluid and is feeling crummy. And so far, she seems to be handling this feed half-way decent, no vomiting, only one brief gag. Sorry for the gross update today. 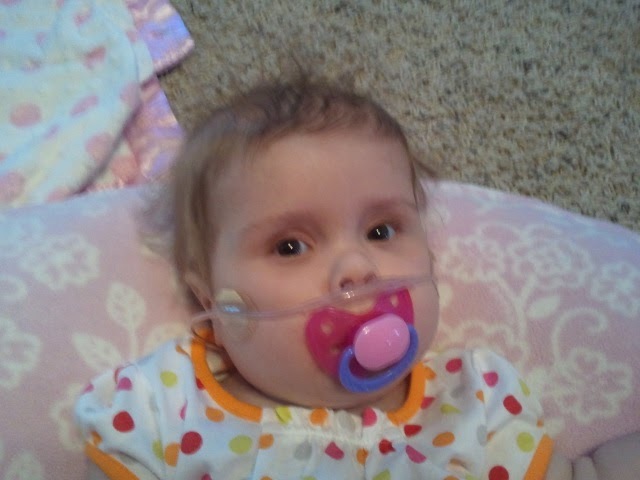 If you could just keep Miss not-feelin’-stellar Annabelle in your prayers, we’d appreciate it! I'm so sorry to hear that Annabelle isn't feeling well, I will be praying. Bummer. Hopefully she gets to feeling better for all of your sakes!